Rare Antique Palais Royal Opaline and Dore Bronze Perfume Set. 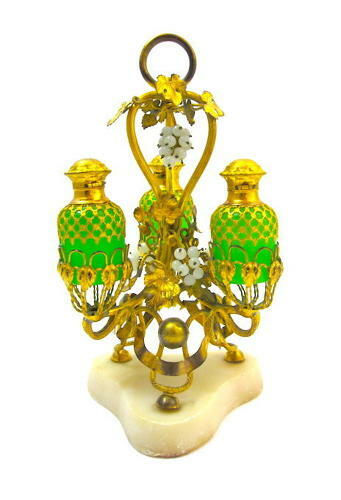 Comprising of Dore Bronze Stand with White Opaline Grapes in between Three Green Opaline Glass Perfume Bottles with Dore Bronze Mounts, All on an Alabaster Base. All Perfume Bottle Include Inside Stoppers. Bottles 6.5 cms / 2.6"